Stitched Together: And baby makes five! Or seven, depending on who you're counting. And baby makes five! Or seven, depending on who you're counting. We are thrilled to share our news that we are expecting our 5th 'gingerbread' at the end of July. We don't know whether we're having a boy or girl yet. 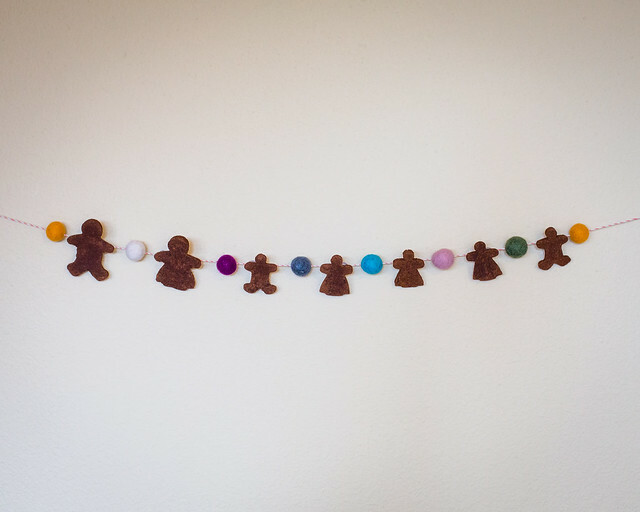 But when we were making our gingerbread family at Christmas time, the kids informed me that the gingerbread boy is more gender neutral than the gingerbread girl. So we went with it. We are hoping to find out the gender of our newest little one next month! I'll be 16 weeks this week and I'm still feeling a little green here and there, but I feel significantly better than I did in my first trimester. That blessed turn of events happened right around 14 weeks. Sooo grateful! 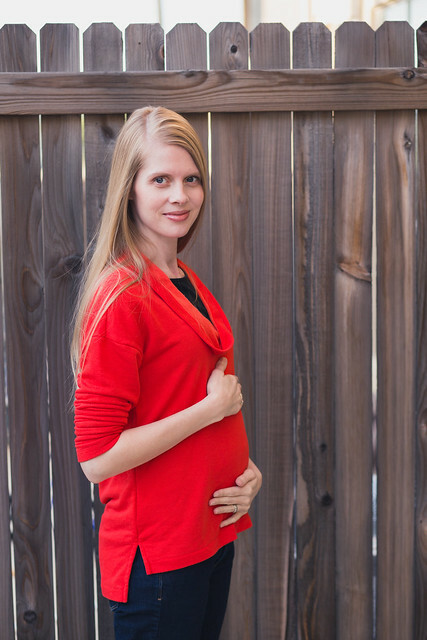 I'm also grateful that I didn't have the bone-tired fatigue that I had with my first two pregnancies. I definitely had much less energy than usual, but I didn't feel like I was going to fall asleep during the day or anything like that - except for two weeks around Christmas. And that brings me to how thankful I am for Dan. He has been so wonderful and supportive in every way. He has cooked so many meals and washed so many dishes - just a rock star all-around. Dan and I joking call this the obligatory 'pregnant and pensive' photo. Most of all, we're thankful for this gift of new life! And so very excited, too! Wonderful! Congratulations! You have a beautiful family! Anyway, congratulations on this new pregnancy, it's fantastic news!! hahahaha! i was thinking the very same thing! Oh my goodness! Congratulations!!!! I'm so excited to watch your amazing family grow again! Congratulations! I've been curious to see who my online "pregnancy buddies" would be this time - I'm 14 weeks, due at the beginning of August. Unfortunately, still bone tired, and it's only my 3rd! Shannon! Congratulations! We are living parallel lives! I was thinking the very same thing - perhaps this will mean an easy baby. Indigo was my most sicky pregnancy and my easiest baby. My pregnancy with Iris was downright idyllic and she was very colicky and a terrible sleeper. Hmmm. :) There's an old wives tale that claims that's how it works! We've given up trying to get Iris to sleep on her own and now she sleeps the whole night with us. She sleeps well, as long as she's right next to us. I night weaned her when she was around 20 months old(ish) so it doesn't really bother me to have her sleeping with us now that I'm no longer the all-night buffet. :) It's a lot easier than trying to get her to stay in her own bed. And we are currently in a townhouse while our house is being repaired. I hope your move going well and congratulations on your newest little one! That is excellent news! Congratulations! What a lucky baby to be joining your wonderful family. well, that's about the nicest thing anyone's ever said to me. :) thank you! Congratulations!!!!!! Love the pics!!! The red is your colour. Yay! Oh, congratulations Rachel! This is so very, very exciting! I'd love to give you a real-life congratulatory hug but a cyber one with have to do:) So glad to hear that you're starting to feel better and have hopefully turned the corner with the "morning" sickness. What a lovely family your new little one will be entering . . . so exciting! AHHHHHH! (That was an electronic squeal.) CONGRATULATIONS!!! So exciting! Can't wait to (virtually) meet him or her! Oh, wonderful!! Congratulations to your whole family, such a lucky little baby to be entering into your loving home. Wishing you a joyful, healthy pregnancy and happy delivery. Thanks so much, Jaime. That means a lot to me. congrats, congrats!!! such wonderful news - so happy for you and your growing family, Rachel! Wow, congratulations! How exciting! You look lovely, and that red really suits you!